Minister Louis Farrakhan leader of the Nation of Islam making his first public appearance in seven months on Sunday, February 25, in Ford Field 2:00 pm in Detroit Michigan. The satellite feed from His Excellency, Omar El-Bashir, President of the Republic of Sudan. President El-Bashir has agreed to answer questions on Dahfur for the press and concerned citizens. Leadership Forum with keynote speaker Rev. Al Sharpton, National Action Network. Rev. Sharpton will discuss the next Presidential election. Imam Siraj Wahhaj, Amir of MANA will deliver the Jumah Khutbah on Friday, Febraury 24. More details and information on the weekend program and activities will be distributed at the press conference. Saviours' Day is the annual commemoration of the birth of the Nation of Islam's founder, Master W. D. Fard Muhammad. The convention is normally held in the city of Chicago, headquarters of the Nation of Islam, but this year thousands will convene to celebrate the Nation's 77th Year Anniversary, in its founding city of Detroit, MI. The convention kicks off on Wednesday February 21, 2007 with an historic exhibit at the Charles H. Wright Museum. International Islamic scholars and Muslim clergy will gather for an interfaith dialogue between Muslims, Christians and Jews on Friday, February 23, along with one of the largest Jumu'ah (congregational) prayer services. Workshops and conferences will be held through Saturday at the Cobo Convention Center on a variety of subjects including youth empowerment, male/female relationships, health, financial literacy, and religious tolerance. The convention will culminate with the keynote address at Ford Field, by the Honorable Minister Louis Farrakhan on Sunday, February 25 at 2pm. Nation of Islam officials are expecting an estimated 65,000 people to attend. 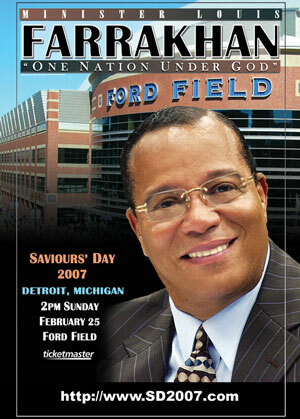 Additional Saviours' Day coverage will be available online by FinalCall.com News.